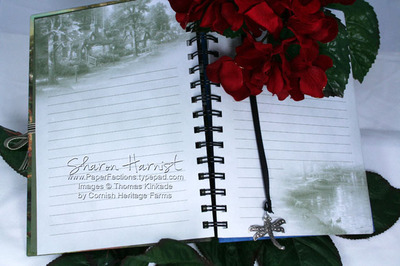 20 entries categorized "Thomas Kinkade Designs"
This journal started life already as a Thomas Kinkade notebook I found at WalMart! 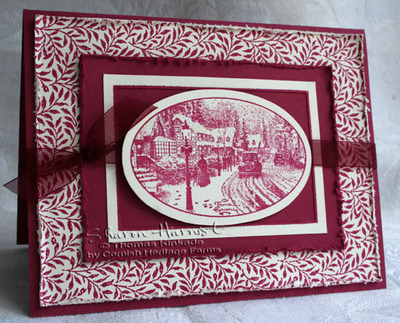 I unbound the journal so I could cover it with the Neenah Classic Crest-Classic Cream cardstock I stamped with Victorian Floral in Versafine Crimson Red. My Bind-It-All assisted in punching holes in the floral cardstock that matched perfectly with the holes already in the journal! The cardstock was adhered to the journal cover with glue stick. Then I put the journal back together with my Bind-It-All and a black wire binding, so it would match my black & red theme (the original wire was antique gold). 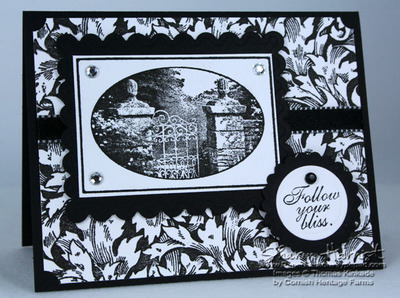 Thomas Kinkade's The Rose Garden was stamped in Versafine Onyx Black on Neenah Classic Cream. Then I tried to replicate a colorized old black & white photo by using a pointed beauty applicator Q-tip and Crimson Red Versafine ink to dot color on to just the flowers. A little bit of Spanish Moss Versafine was usued to accent some greenery (which you probably can't even tell from the photograph). Next, the focal image was inked with a sponge dauber & Ranger Antique Linen Distress Ink (fabulous stuff recommended by my friend, Debbie -- thanks again, Deb! 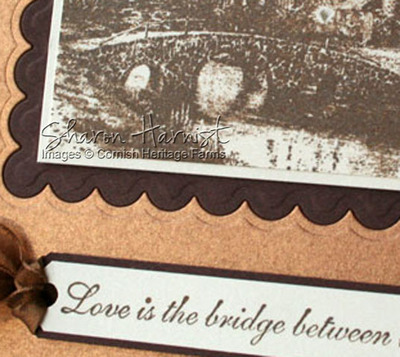 ), the edges distressed and inked with Vintage Photo Distress Ink. 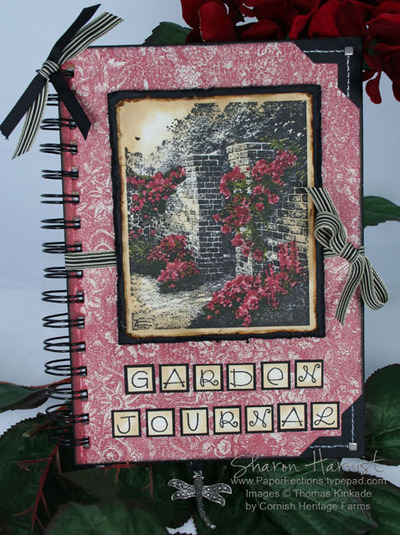 It was matted with a distressed piece of Black Prism cardstock and mounted to the journal with dimensional foam tape. 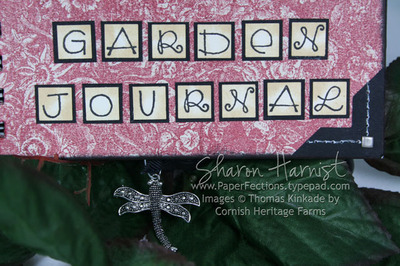 The Garden Journal "Scrabble tiles" were stamped with Kim Hughes' Quirky Alphabet onto Cream Neenah Classic Crest with Versafine Onyx Black ink and fit perfectly within a 1/2-inch square punch. They were then matted with Black Prism cardstock. The edges were inked with Antique Linen Distress Ink. The photo corners were punched with EK Success Corner Punch and faux stitched with white gel pen. 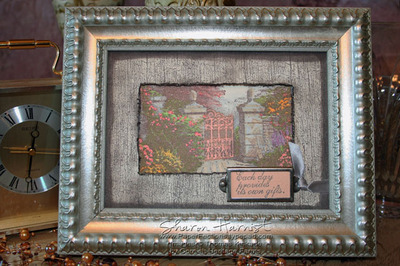 Mini pewter square brads by Making Memories accent the corners. May Arts black/ivory striped ribbon is tied underneath the focal image. A beautiful jewelled metal dragonfly embellishment serves as a bookmark, by tying it to black grosgrain ribbon and the top binding wire. I don't know the exact source of this dragonfly, but about 90% sure it was a gift sent to me by Lisa Strahl (our Cornish Heritage Farms' Art Director) a few years ago! 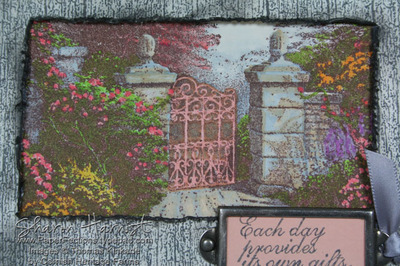 What I liked about using this Thomas Kinkade journal to alter, was that the pages are also imprinted with some Thomas Kinkade outdoor scenes! All Stamps by Cornish Heritage Farms: Thomas Kinkade "The Rose Garden", SonLight Impressions "Victorian Floral", Kim Hughes Collection "Quirky Alphabet". 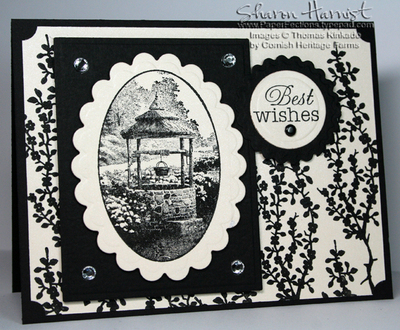 Paper: Neenah Classic Crest-Classic Cream from Ellen Hutson, Black Prism. 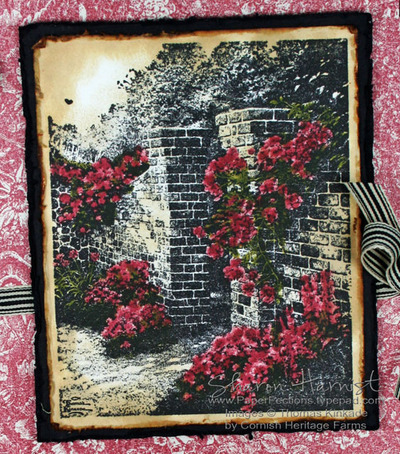 Ink: Tsukineko Versafine: Crimson Red, Onyx Black & Spanish Moss, Tim Holtz Distress Ink by Ranger: Antique Linen, Vintage Photo & Black Soot. Accessories: Tim Holtz Edge Distresser by Tonic, EK Success Corner & 1/2-inch Square Punches, May Arts Striped Ribbon from StarLitStudio, Black Grosgrain Ribbon, Making Memories Mini Pewter Square Brads, Paper Piercing Tool, White Gel Pen, Sponge Dauber, Jeweled dragonfly metal embellishment-unknown source, Thomas Kinkade journal from WalMart, Bind-It-All & 7/8' black wire binding, glue stick. 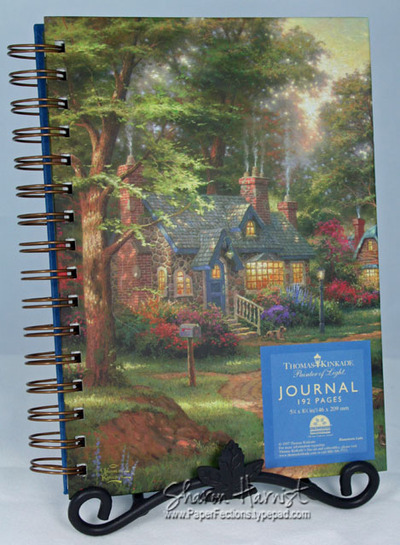 Check back in tomorrow for another Thomas Kinkade sample! I was given the okay to go ahead and post a sneak peek of the Thomas Kinkade stamps that will be released for sale tomorrow, so here's the first one! Sorry, I had to do it . . . Elvis on velvet! In honor of the King of Rock & Roll's birthday today, what appropriate timing for this new 50th Anniversary of Graceland Thomas Kinkade painting to be turned into a rubber stamp! It will be released and only available for sale at Cornish Heritage Farms starting tomorrow, Jan. 9. 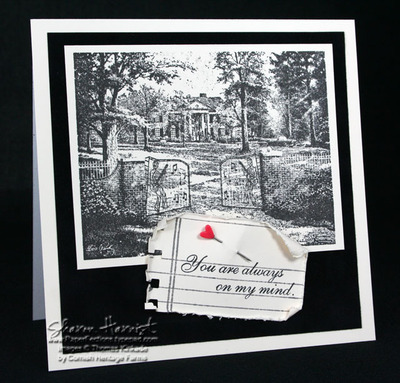 Thomas Kinkade's Graceland is stamped in Versafine Onyx Black on Neenah Classic Crest-Classic Cream cardstock and mounted with dimensionals to the black velvet SEI paper. 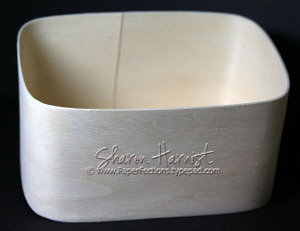 Card base is 6" square Neenah Classic Cream. 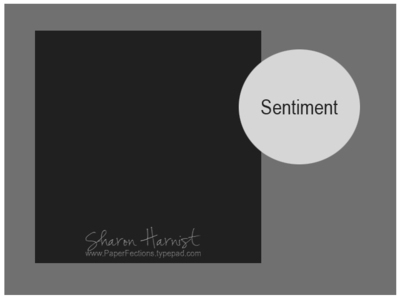 Cornish Heritage Farms' Lined Paper backgrounder was just released in November and is stamped in Adirondack Slate dye ink on Classic Cream and and Always On My Mind sentiment is stamped with Versafine black. The edges were distressed and holes punched on the left side, to resemble torn notebook paper. Decorative heart pin is pierced thru the note, which is applied with foam dimensional tape to the card. 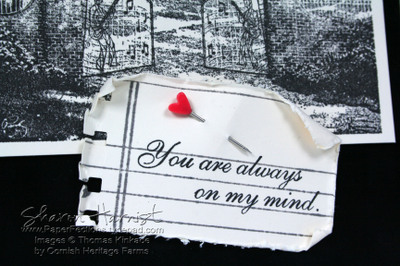 All stamps by Cornish Heritage Farms: Thomas Kinkade Graceland & Always on my Mind, CHF Lined Paper backgrounder. Paper: Neenah Classic Crest-Classic Cream, SEI black velvet paper. Ink: Tsukineko Versafine Onyx Black, Ranger Adirondack Slate dye ink. Accessories: Heidi Grace red decorative heart pin, Tonic Edge Distresser, foam dimensional tape, hole punch. You can see more samples of the new releases of Thomas Kinkade stamps HERE in the CHF gallery, after it's opened up tomorrow. 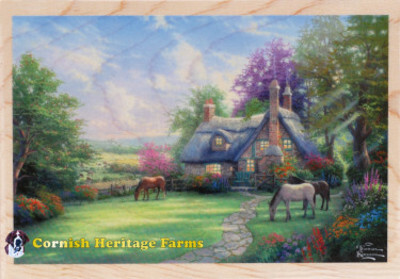 Check back for the next few days for some more new Thomas Kinkade samples! Today is my friend & CHF's Art Director, Lisa Strahl's, birthday and to celebrate Cornish Heritage Farms is hosting a big birthday bash with hourly challenges and prizes! To top it off, CHF is releasing 16 new background stamps today that Lisa designed! You can view them all HERE in the New Products listing at CHF's online store. 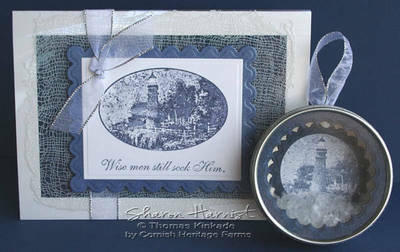 CARD DETAILS -- Stamps: Thomas Kinkade Make a Wish Cottage Vignette, Kim Hughes Silhouette Blooms I. Paper: Prism Black, Curious Iridescent Poison Ivory. Ink: Brilliance Graphite Black. Accessories: Spelbinders Nestabilities, SU Ticket Corner Punch & Black Brad, Crystal Stickers, Dimensionals. So hop on over the the CHF Birthday Bash Forum, check out all the excitement and join in the fun today! "Best Wishes" to Lisa on her birthday today! Somehow, I forgot to post this after making it this summer, so since it's nearing the holiday season I thought I'd share it. 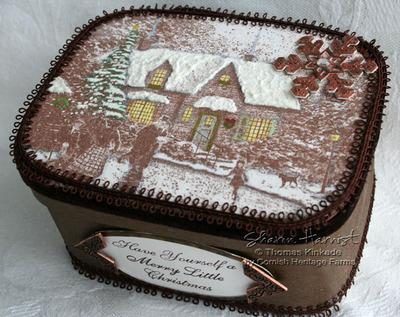 This is Thomas Kinkade's Village Christmas by Cornish Heritage Farms. 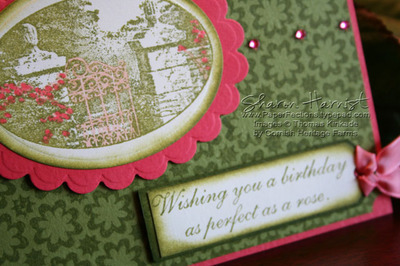 It was stamped in Stampin' Up's Pomegranate ink on SU's Vanilla cardstock. 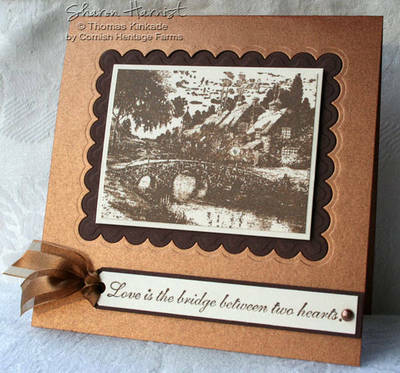 The main image was matted with Marvy scalloped punches of Pomegranate cardstock and is adhered to the card base with dimensionals. The red velvet ribbon is May Arts from StarLitStudio, adorned with a Making Memories rhinestone buckle. The backgrounder is Cornish Heritage Farms' Victorian Leaves, also stamped in Pomegranate ink. The sentiment is a "We Wish You . 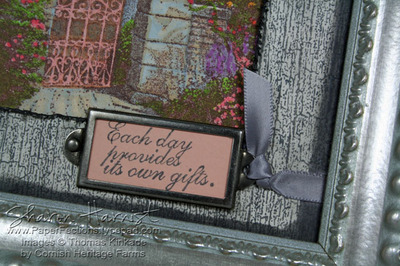 . ." also from the Thomas Kinkade line by CHF. Making Memories crystal brads finish off the corners of this card, which I believe was about 5.50" square. I hope you all are enjoying the week. I'm trying to catch up on some deadlines and hope to have a new card to share with you by Friday, for Beate's sketch challenge! 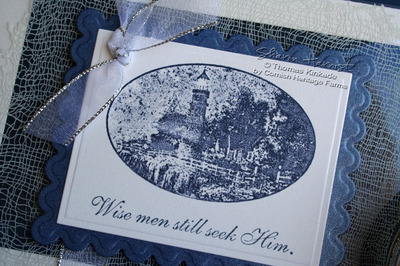 Here's a last sneak peek at another Thomas Kinkade rubber stamp project . . . I hope you have enjoyed the peeks and will be back on Thursday, when I'll post all of my full samples and the stamps are officially released for sale! Keep a watch on the Cornish Heritage Farms' blog, too, as I'm sure Liz will have some announcements! Another Thomas Kinkade Sneak Peek! Are you ready for some beautiful winter/holiday-themed stamps? 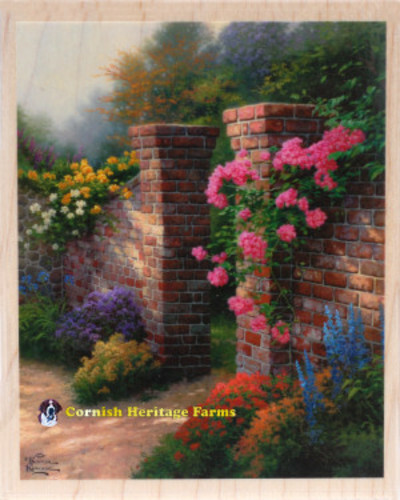 Then you won't be disappointed with Cornish Heritage Farms' next release of Thomas Kinkade rubber stamps! There will be TWO beautiful full-sized and vignette-sized winter images that will be perfect for your holiday cards for years to come! Plus, a couple of new holiday sentiments as well. The release is scheduled for this Thursday so until then, when I'll post my full projects for you to see, check back here tomorrow for another sneak peek (yes, I know I'm a tease)! Here it is . 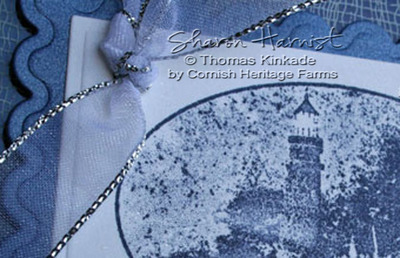 . . a little sneak peek at the next Thomas Kinkade rubber stamp release by Cornish Heritage Farms to happen later this week. 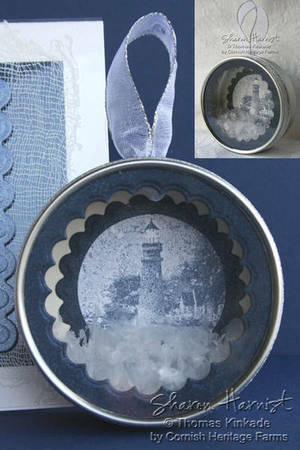 And one is the lighthouse you all have been asking for! So stayed tuned for that . . .
Don't forget to check out the blog giveaway I have going in the post below . . . it ends at 10am tomorrow (Tuesday)! 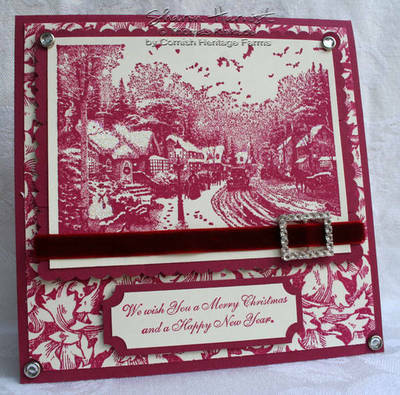 I wanted to try my new Thomas Kinkade rubber stamps stamped in a monochromatic theme, just to see what kind of quick Christmas card I could make. The results reminded me of a toile pattern! 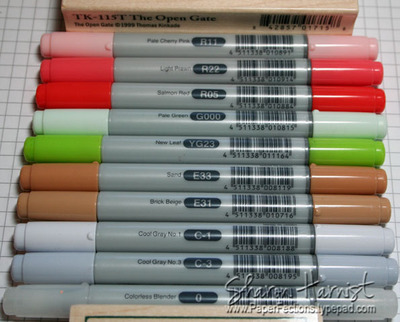 There has been much discussion over what types of ink & paper work best with these highly detailed images, so I thought I'd post a few references for you. 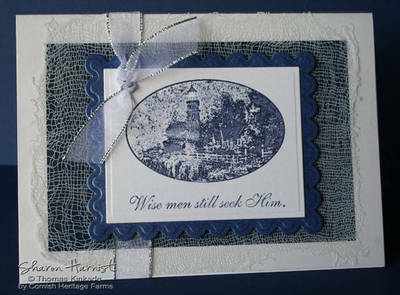 One of our Thomas Kinkade designers (Keri Sereika) put together her findings of what inks worked best for her on Stampin' Up's Whisper White cardstock here. Another compilation of the Design Team's ink testing was posted by Lisa Strahl here. And here is another compilation by Lisa on papers we all tested. I hope these lists help you with your new Thomas Kinkade rubber! 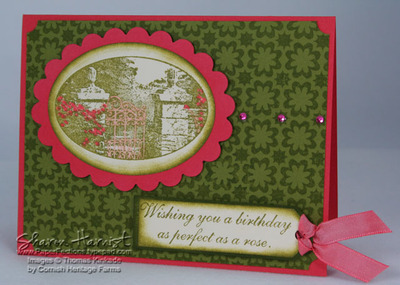 So here's what I used on this card: Stampin' Up's dye ink in their fabulous new color of Purely Pomegranate (this is by far my favorite new SU In Color!). 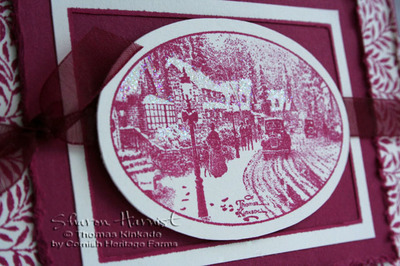 I used a brayer to ink up the TK Village Christmas Vignette image -- this way, you don't get too much ink on your stamp and it's all evenly placed, with no puddles to worry about. I found a lighter hand when stamping the image on Very Vanilla worked best to preserve the detail -- this is a little hard for me to do since I typically stamp pretty hard! The vignette image was trimmed around the oval using Coluzzle's Long Oval template and then I trimmed the rectangle close to its line image, leaving a small barely over 1/8" of the frame that was adhered to the Pomegranate mat. The oval was popped up on dimensionals. I also inked the Leaves #3 backgrounder stamp in the Pomegranate ink using the brayer. It's also stamped on vanilla cardstock, the edges distressed and adhered to the Pomegranate card base. 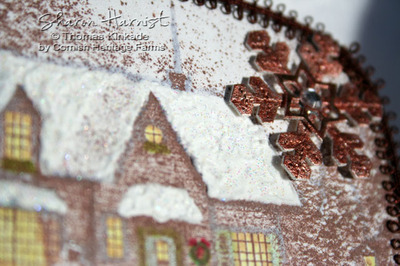 Stamps: Village Christmas Vignette (Thomas Kinkade), Leaves 3 (SonLight Impressions), all from Cornish Heritage Farms. Paper: Stampin' Up! Purely Pomegranate & Very Vanilla. Ink: Stampin' Up! Classic Purely Pomegranate. 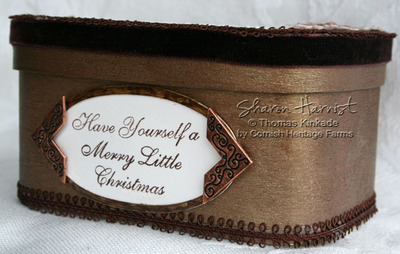 Accessories: Tonic Edge Distresser, Coluzzle Long Oval Template, Brayer, Zig 2-Way Glue. SU Dazzling Diamonds Glitter, Wine Narrow Organdy Ribbon, Dimensionals. As you can see, you can create a very striking card with no coloring of these Thomas Kinkade images, so don't be afraid to try them, even if you think you can't (or don't want to take the time) to color them in!